For the year-to-date, U.S. shipments of residential gas storage water heaters decreased 12.2 percent to 1,791,181, compared to 2,040,295 units shipped during the same period in 2015. 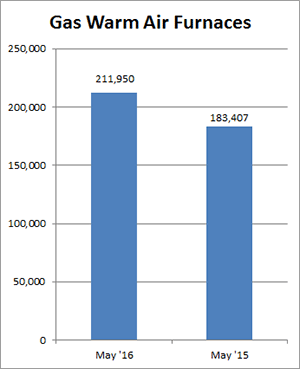 Residential electric storage water heater shipments decreased 16.3 percent year-to-date to 1,665,930 units, compared to 1,991,150 units shipped during the same period in 2015. 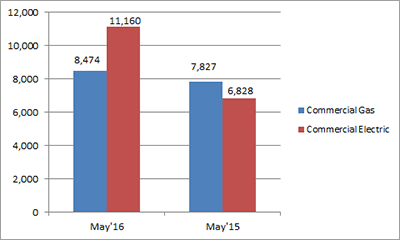 Commercial gas storage water heater shipments increased 8.3 percent in May 2016 to 8,474 units, up from 7,827 units shipped in May 2015. 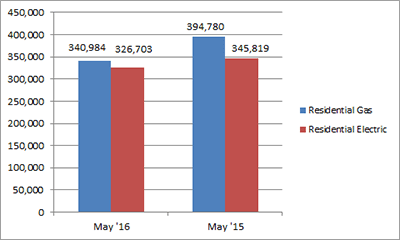 Commercial electric storage water heater shipments increased 63.4 percent in May 2016 to 11,160 units, up from 6,828 units shipped in May 2015. Year-to-date U.S. shipments of commercial gas storage water heaters decreased 5.4 percent to 42,925 units, compared with 45,393 units shipped during the same period in 2015. Year-to-date commercial electric storage water heater shipments increased 44.7 percent to 51,078 units, up from 35,289 units shipped during the same period in 2015. 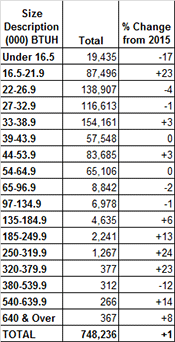 U.S. shipments of gas warm air furnaces for May 2016 increased 15.6 percent to 211,950 units, up from 183,407 units shipped in May 2015. 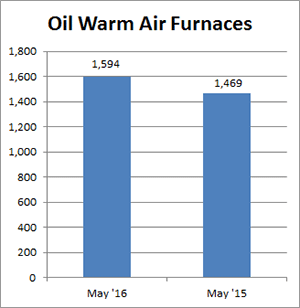 Oil warm air furnace shipments increased 8.5 percent to 1,594 units in May 2016, up from 1,469 units shipped in May 2015. Year-to-date U.S. shipments of gas warm air furnaces increased 5.2 percent to 1,014,193 units, compared with 964,095 units shipped during the same period in 2015. 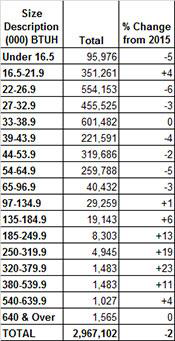 Year-to-date U.S. shipments of oil warm air furnaces decreased 7.7 percent to 11,050, compared with 11,977 units shipped during the same period in 2015. U.S. shipments of central air conditioners and air-source heat pumps totaled 748,236 units in May 2016, up 1.5 percent from 737,467 units shipped in May 2015. U.S. shipments of air conditioners increased 2.3 percent to 510,552 units, up from 499,250 units shipped in May 2015. 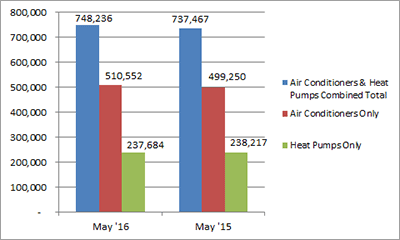 U.S. shipments of air-source heat pumps decreased 0.2 percent to 237,684 units, down from 238,217 units shipped in May 2015. Year-to-date combined shipments of central air conditioners and air-source heat pumps decreased 2.5 percent to 2,967,102 units, down from 3,042,250 units shipped in May 2015. Year-to-date shipments of central air conditioners decreased 1.2 percent to 1,952,676 units, down from 1,976,501 units shipped during the same period in 2015. The year-to-date total for heat pump shipments decreased 4.8 percent to 1,014,426 units, down from 1,065,749 units shipped during the same period in 2015.